If there's one thing Beatrice Tanaka never wanted to be, it's normal. But somehow, her life has unfolded as a series of "should haves." Her powers of emotional projection should have made her one of the most formidable superheroes of all time. And she should have been allowed to join her older sister Evie as a full-fledged protector of San Francisco, pulverizing the city's plethora of demon threats. But Evie and her superheroing partner, Aveda Jupiter, insist on seeing Bea as the impulsive, tempestuous teenager she used to be--even though she's now a responsible adult. And that means Bea is currently living a thoroughly normal life. She works as a bookstore lackey, hangs out with best friends Sam Fujikawa and Leah Kim, and calms her workplace's more difficult customers. Sure, she's not technically supposed to be playing with people's mental states. But given the mundanity of her existence, who can blame her? 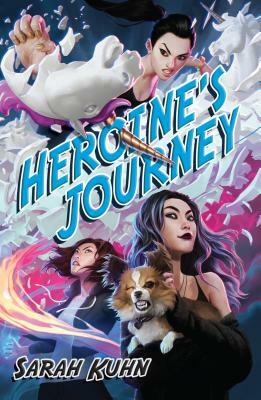 Sarah Kuhn is the author of the Heroine books--starring Asian American superheroines--for DAW Books. She also wrote the romantic comedy novella One Con Glory, which is in development as a feature film. Her articles and essays on such topics as geek girl culture, comic book continuity, and Sailor Moon cosplay have appeared in multiple publications. In 2011, she was selected as a finalist for the CAPE (Coalition of Asian Pacifics in Entertainment) New Writers Award.